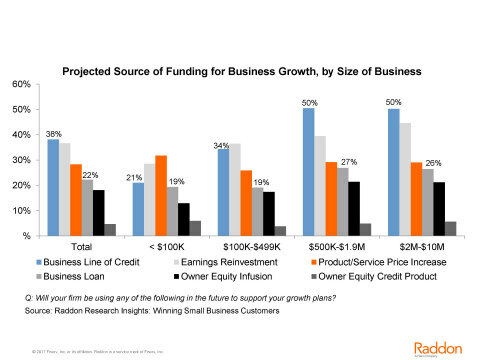 RaddonSM, a Fiserv® company and provider of innovative research, insightful analysis and strategic guidance to financial institutions, has published research that shows the majority of small businesses are planning for growth, which they anticipate funding through lines of credit and business loans. According to the Raddon Research Insights: Winning Small Business Customers study, 79 percent of small businesses plan to grow over the long term, which could create lending opportunities for financial institutions. Of the 79 percent of small businesses planning for growth, about a third (38 percent) said they plan to use a business line of credit for funding, whereas 22 percent said they plan to use a business loan. These percentages rise to 50 percent for a business line of credit and 26 percent for a business loan among larger small businesses with $2 million to $10 million in annual sales. When it comes to deciding whether to use a financial institution’s services, small business customers of major banks were the most likely to cite technology as a factor in the decision. Among small business customers that use a major bank as their primary financial institution (PFI), 66 percent indicate the technology resources available at the institution influenced their decision to use the bank, with 29 percent saying it strongly influenced their decision. Small businesses with a credit union as their PFI also showed a significant interest in technology, with 42 percent saying technology influenced their decision and 16 percent saying it was a strong influence. Although 91 percent of small business customers still make branch visits in a typical month, technology is starting to reduce branch traffic. Forty-two percent of small businesses indicated they now use branch lobbies and drive-ups less frequently due to the availability of online banking, mobile banking, and remote deposit. Looking forward, one in three small businesses (36 percent) think technologies such as mobile and online banking could potentially replace their need for a branch office of their PFI near their place of business. While major banks currently control the small business market with 68 percent of primary financial institution relationships, there are opportunities for community-based financial institutions to serve more small businesses, with small business owners indicating a likelihood to work with such institutions in the future. Over 50 percent of small businesses that currently do not use a community bank for their primary or secondary institution said they were extremely or very likely to consider using a community bank in the future, and 38 percent said the same for a credit union. The research in the Raddon Research Insights: Winning Small Business Customers study was gathered from semiannual surveys conducted in 2014, 2015 and 2016. Each survey of approximately 1,200 small business owners was conducted via an online questionnaire administered through a national online panel of small businesses, with respondents qualified by having decision-making responsibility for financial services for their company. An Executive Summary of the research is available at https://fisv.co/raddonsmallbizinsights and the full 49-page report can be purchased at raddon.com. Raddon will host a webinar on the study on June 8, 2017 for purchasers of the report.